I hate French Knots. In fact, I hate them so much that I try to avoid stitching them whenever possible. I don’t like their massed tight curls and so I have developed a way to stitch an area with French Knots so that it looks more natural and shaded. I shied away from using them in needlepoint for years. I made the great head on some beer on a Raymond Crawford coaster using Flair and organdy ribbon in a bunch of widths. I also used it on a sheep for a nativity. Here I used Kreinik metallics for the head. I begin by putting a layer of stitching using thinner than normal thread all over the area to be covered with French Knots. Then I don’t have to worry about covering every little bit of canvas and getting that French Poodle effect. I make the French Knots in passes using at least two different sizes of needle (the bigger the needle, the bigger the knot), and two different shades of thread. Usually it’s more. The first pass uses the smallest needle and the darkest thread. I scatter these knots all over the canvas, clumping them in groups. The second pass is the main color, I use the smallest needle and the lighter color of thread. These take up most of the area, but are still stitched in clumps. The third pass uses the darker thread again and the bigger needle. These are groups of one or two knots and there are very few, just to give definition. The final pass uses the bigger needle and the lighter thread. I concentrate these knots where the light will hit the object. If I think there isn’t enough light hitting, I will add just a very few small knots in an even lighters color. The Knots overlap each other and the effect is quite realistic. You can also do this technique with an underlayer of green and knots in different color to make a flower-strewn field. 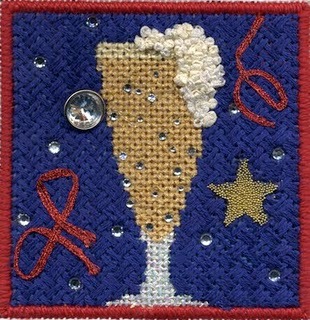 BTW, the instructions for the beer are a stitch guide available from my Etsy shop. These are terrific suggestions! I would love to highlight this on CraftGossip but would really like to see a bigger picture of that beer . Oh Janet I am SO with you when it comes to French Knots…..I hate them with a passion, and as a cross-stitcher as opposed to needlepoint, I may have to give this a try, however, what I do instead of making French Knots is go through my hoard of Mill Hill beads and use those instead.